With two new online safety courses from Snowmobile Ed and Offroad Ed, Minnesota students can complete their snowmobile and off-road training online from the comfort of their homes. We take education seriously; that’s why we invest in award-winning videos, animations, and more—we want students to gain the knowledge they need to be safe and responsible operators. Minnesota offers a wonderland of opportunities for snowmobiling and off-roading, but riders need to be safe. With two new online safety courses, Minnesota students can complete their training online from the comfort of their homes. 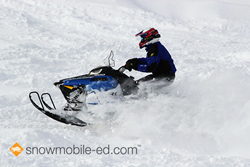 Snowmobile riders can complete the classroom portion of their required snowmobile safety education entirely online at http://www.snowmobile-ed.com/minnesota. ATV and OHM riders have similar options for their required off-road safety education, with an online course at http://www.offroad-ed.com/minnesota. These official courses are approved by the Minnesota Department of Natural Resources. For each course, young riders must complete an in-person field test in addition to the online curriculum, but students over 16 can complete the course entirely online. This allows students to be safe and get out on the trails faster. The courses are responsive and available on any device or smartphone with Internet capabilities, so students can learn at their own pace wherever they are. Each course also features exciting live-action videos, realistic illustrations and animations that make learning safe ATV/OHM or snowmobile operating a fun and interactive experience. The course is Minnesota-specific, with lessons revolving around the local trails that students will be riding on. Lessons cover topics such as off-highway motorcycle operation, Class 2 ATV operation, how to dress for winter weather, and more. Kalkomey Enterprises, LLC, parent company of snowmobile-ed.com and offroad-ed.com, is an official provider of recreational safety education materials for all 50 states, as well as Canada and New Zealand. An American company based in Dallas, Texas, Kalkomey produces print and Internet courses that have provided official safety certification since 1995. Kalkomey offers safety courses in boating, hunting, bowhunting, and off-road vehicle and snowmobile operation. For more information, visit http://www.kalkomey.com.